How do you drive a better return from your 2019 marketing plan? The first clue is …….it starts with your team! Kick off 2019 by giving your marketing team a capabilities injection! The Pt78 one day seminar is designed to support marketing teams in managing what is often the largest chunk of their marketing investment - the media budget. We combine research with case studies and practical guides, frameworks and tailored workshop sessions. 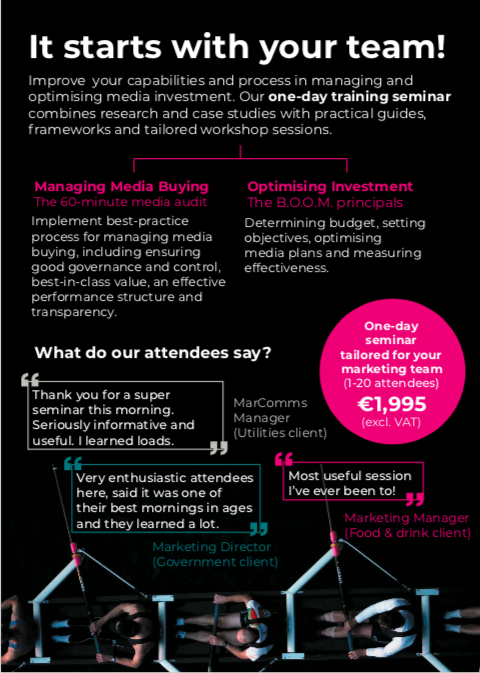 The session will focus on Managing Media Buying (the 60 minute media audit) and Optimising Investment (The B.O.O.M. Principles). Our delegates leave feeling energised and equipped to implement best-practice process for the management of media buying and everything that goes with it. Contact us to find out more or to book a date for your team. Will a media audit tell you where to stop, start or continue investing your marketing budget?